Who Else Wants to Feel Younger and Healthier? 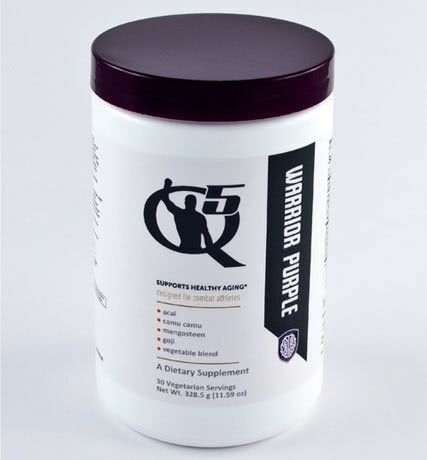 Warrior Purple is a super potent anti oxidant drink mix that will help your body stop rusting from the inside out. You know, oxidation = rust right? And something very similar happens inside your body all the time. Add in the rigors of training and your levels of oxidation damage can increase significantly. Stress much? That increases the damage even more. You’ve heard all the hype about super fruits. Dark berries have some of the most powerful and concentrated anti-oxidants in nature. Eating enough of these fruits and vegetables can help protect your cells from damage. Anti-oxidants act kind of like a sponge to soak up the particles called free radicals that actually cause the damage. So the facts behind the berry hype are real, they do help. And to be completely honest, eating whole fresh berries is a better solution than this drink mix. But who’s got the time and money to juice up $30 worth of fruits and vegetables every day? Not me, and I’m betting not you either. Go ahead… name a super berry. Any super berry. Yup, it’s in here. Can’t get fresh acai in your local neighborhood bodega? We’ve got you covered. How about blueberry, blackberry, black cherries, black rasberries, black currants, plums, elderberries, bilberries, figs, eggplant, purple cabbage, acai, camu camu, mangosteen, and goji. Sounds pretty good eh? Add in some brain blasting goodies and you’ve got yourself a nice little drink mix supplement. You’re welcome. The taste? 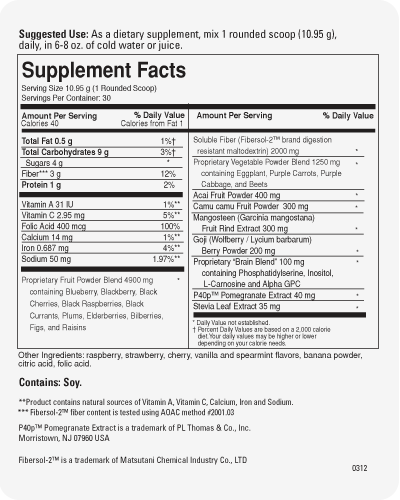 It’s great in vanilla protein, coconut water, or sports drink. It also works well in any kind of fruit juice. I think it’s tolerable in water, but some of the guys who tried it in straight water loved it like that. Just be aware that if you’re looking for something that tastes like grape Kool-Aid you might be disappointed. Hey, it’s all natural with no artificial flavors or sweeteners – if you’ve got a beef with the taste take it up with Mother Nature. I’m sure she’d be interested to hear your take on fruit flavorings.